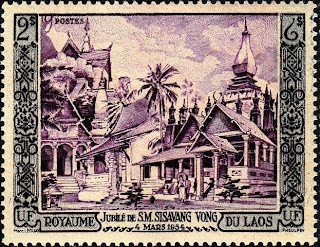 In 1954, Laos issued a compound set of stamps picturing Laotian temples, in honor of the 50th Anniversary of the Accession of King Sisavang-Vong (Scott #25-26, C13). This is the key set of Laos, and is, in my opinion, one of the most beautiful modern engraved sets. 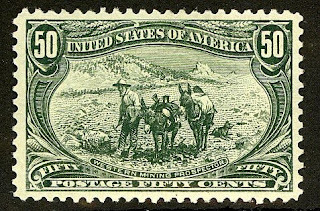 The airmail is the scarcest stamp in the set, and although printing quantities are not known, I'd guess that fewer than 20,000 were issued. Scott '10 values the unused set at $ 237.50. 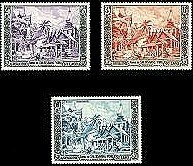 The set has multiple appeal to collectors of Laos, Indochina, and to collectors of French Colonies/Area, as well as being a Buddhism Topical. 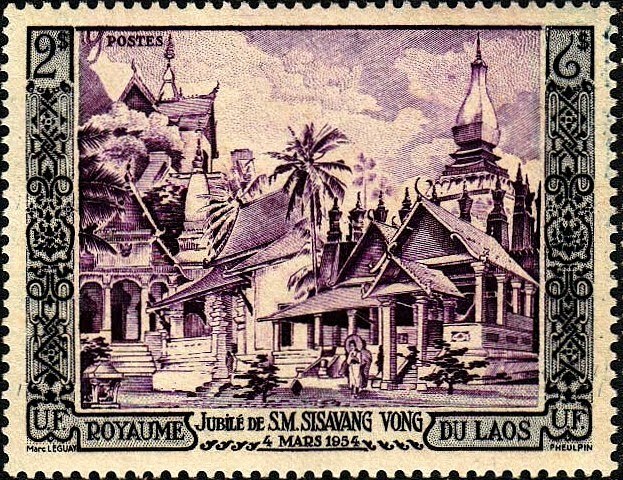 While I do not believe that demand for stamps of Laos will increase among Laotians in the near future, I do foresee a growth in the number of collectors of French Colonies/former colonies and Indochina in general. A nation of 6.3 million, Laos is a poor, though rapidly developing nation which is heavily dependent upon trade with its neighbors, China, Thailand, and Vietnam. 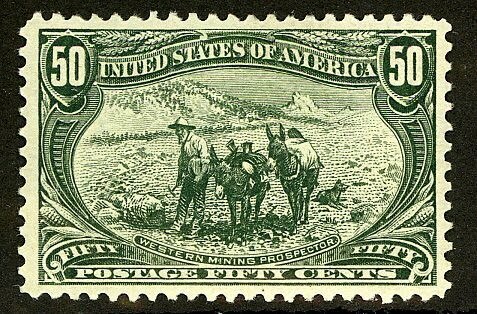 Subsistence agriculture still accounts for half of the GDP and provides 80 percent of employment. However, the mining and tourism industries are growing rapidly, and the government is taking steps to significantly upgrade the country's infrastructure, with the help of foreign aid. Annual GDP growth has averaged over 7% over the last 5 years.